Wilfrid Laurier University is saddened by the passing of Victor Martens, professor emeritus in the Faculty of Music, on Nov. 25 in his 87th year. 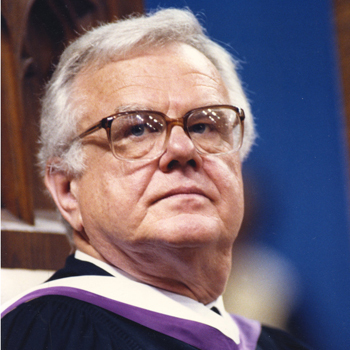 Martens was an award-winning professor at Laurier for 37 years, beginning in 1969, and was a powerful influence in both music education and performance around the world. He is credited with starting Laurier’s voice program, growing the reputation of the Faculty of Music and coaching hundreds of students, many of whom have gone on to sing on the most important stages of the world. Before beginning his career at Laurier, where he earned his undergraduate degree in 1964, Martens performed with symphony orchestras in Germany as well as in Ottawa, Winnipeg, Saskatoon, Edmonton, Vancouver and Kitchener-Waterloo. His performances have been broadcast on the radio in London, Frankfurt, Zurich and Geneva, as well as on CBC Radio. Martens has won numerous awards for his contributions at Laurier, including the Outstanding Alumni Award in 1986, the Teacher of the Year Award in 1987, and the Hoffman-Little Award for Excellence in Teaching and Professional Endeavours in 2011. In 1992, he was recognized with an Honorary Doctorate of Laws from the University of Waterloo. "Victor inspired me during the most magical years of my musical life,” says Jane Archibald (BMus ’99), a former student of his. “Many exciting things have come to pass in my career, but it is my years of discovery, working with Victor, that stand out as the most thrilling. His support, his contagious joy about the art of singing and his unwavering belief in my abilities resonate as strongly today as they did then. His legacy will be deep and enduring, as is my gratitude for the gifts he gave me. I will miss him." Martens continued to work after his retirement, including this term, when he taught a studio course for a fellow professor on sabbatical. Flags will be lowered to half-mast across the university in recognition of this loss to the Laurier community. Martens' family will receive visitors at the Erb and Good Funeral Home on Saturday, Dec. 1 from 1 to 4 p.m. and 7 to 9 p.m. and on Sunday, Dec. 2 from 1 to 4 p.m. There will be no funeral, but a musical celebration of his life will be held in the coming months. In lieu of flowers, the family is asking for donations to the Food Bank of Waterloo Region or Mennonite Central Committee.